In Oregon forests, potential logging impacts are reduced by Forest Practices Act regulations which limit the size and placement of harvest units, specify road standards, and require that buffer strips be left in stream corridors. These tree-filled buffer strips provide cover for fish, and help shade streams from the hot summer sun. Where harvesting is concerning, the enemy is erosion, chiefly in the form of landslides. While logging activities are frequently seen as a source of landslides, soils scientists and hydrologists tell us old roads -- built under outdated standards -- are more of a problem than is the actual harvest. Much has been done to upgrade road construction standards, and new forest roads are much less of a problem than are roads built years ago. Of course there is always room for improvement, but we've learned a great deal about where to build roads and where not to build them. While rarely viewed in these terms, water is indeed a forest product. Almost all municipal water originates in forests, and in the West, almost 70 percent of useable water comes from managed forests -- many such forests where harvest occurs. And water itself can be a casualty of catastrophic natural disturbances, including wildfires that leave soil exposed to severe erosion. Across the nation, more than 130 water companies manage their own forest lands for the domestic water they provide for communities served. In fact, forestry, timber harvest, and watershed management were intertwined disciplines as far back as 1500 B.C. when the Chinese began altering their forests to regulate stream flows into irrigated fields. In 1897, our own Congress cited watershed management as one of the chief reasons for establishing the national forest system. Today, virtually every community in the Pacific Northwest gets its water from watersheds that begin in national forests -- where timber harvest has successfully co-existed with clean water in some areas as long as 100 years. Below are some other facts about Oregon forest law you may find interesting. 1941:--State adopts Oregon Forest Conservation Act. Reforestation and fire protection are primary objectives, although erosion control is also an objective. 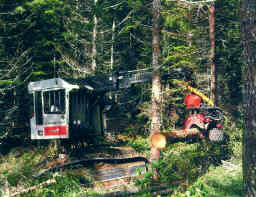 1971:--With industry support, Oregon legislature approves nation's first Forest Practices Act. New law sets minimum standards for stream protection, reforestation, road construction and maintenance, timber harvesting, chemical applications and slash disposal. Legislation governs private and state lands. Emphasis is on prevention of problems and encouraging private forest stewardship. Law becomes a model for other states. 1972-1985:--State Board of Forestry adopts additional rules aimed at minimizing soil erosion, disturbance, landslides, and stream impacts. 1987:--Riparian protection rules amended to require larger stream and wetland buffer widths. 1990:--Oregon Forest Industries Council proposes major reforms designed to strengthen protection for water quality, streams, reforestation, clear-cut limits, and snag and green-tree retention. 1991:--Legislature instructs Board of Forestry and state Department of Forestry to revise stream protection rules. Objective is to provide equal protection for fish present in all Oregon streams. 1995:--New stream protection rules are implemented. Streamside objectives include creating forest conditions present in natural timber stands 80 to 200 years old, lower water temperatures, easier upstream fish passage, increased amount of in-stream large woody debris and increased fish survival. In time, more streamside trees will provide better habitat for fish. 2001:-- Again, with forest industry support, the Oregon Legislature instructed a revision of the Forest Practices Rules to address protection of public safety from rapidly moving landslides that can originate from forests. Harvesting and road building operations upslope from highways and residences may be modified, where there is a public safety risk due to potential landslides. 2003:-- New forest road rules are implemented. Improved road objectives include wet weather road use standards that would prevent muddy water delivery from operation roads to Oregon forested streams. In 1994 and 1997, the Oregon State University Forest Engineering Department completed important reviews of scientific studies related to timber harvesting effects on water quality and quantity in the Pacific Northwest. The reviews were commissioned by the Oregon Forest Resources Institute and conducted by Dr. Paul W. Adams, a department professor and forest watershed specialist. The reviews summarize the findings of nearly 100 published studies of the effects of logging and forest roads on water quality and quantity. Public interest in watershed-related issues is high in the Pacific Northwest, and many believe forest road construction and logging are major causes of flooding, erosion and declines in both salmon habitat and the number of migrating salmon. But Dr. Adams' review of available scientific literature dating back to 1959 reveals "insignificant, positive, negative and combined effects that were greatly influenced by the specific location, treatments and duration of study." In other words, while logging and forest road construction do indeed have localized short-term impacts on water quality and quantity, there is no evidence these impacts are widespread or longstanding. Several studies Dr. Adams reviewed point to increased peak stream flows during rainy or snowmelt periods after timber harvesting, but these effects are more closely linked to heavy rains than to logging itself. Moreover, Dr. Adams noted, "stream flow increases after logging, become smaller with time, eventually disappearing when the canopy of the replanted forest begins losing as much water to the atmosphere as the original forest." Water quality and quantity impacts are more prevalent in areas where logging and road construction activities occupy a comparatively large portion of the total watershed. In larger watersheds, "little or no effect on stream flow is expected" because individual logging operations affect an area that is small when compared to the overall size of the watershed. 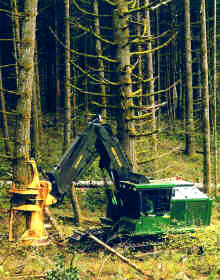 Although the studies Dr. Adams reviewed appear to minimize the long-term impacts of logging and road construction, he was quick to point out that studies conducted in the 1960s led to changes in the Oregon Forest Practices Act, restricting or prohibiting the removal of streamside vegetation which helps hold soil, while insulating streams against summer and winter temperature extremes. Although logging systems in use then were often blamed for declining water quality and quantity, Dr. Adams wrote that many studies did not clearly distinguish between logging impacts and those related to outdated road construction, slash burning or stream cleanup rules in effect in the 1960s, 1970s and 1980s. Research suggests that the widespread practice of stream clean-up (removing woody debris to enhance fish passage, etc. ), promoted during this period by fish biologists, also may have contributed to channel erosion and sedimentation. Adams wrote, "Where water quality measurements continued for several years, sediment levels generally declined or disappeared as re-vegetation and other stabilization occurred. Where patch cutting or harvest layout maintained streamside vegetation, increases in stream sediment generally were significantly reduced or avoided." Beyond regulatory changes that grew out of 30-plus years of watershed studies, improved technology has also played a central role in maintaining water quality and quantity. 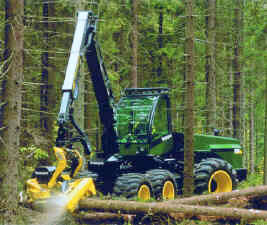 New road construction techniques and design changes in logging equipment provide an added measure of protection for watersheds. The studies Dr. Adams reviewed also evaluated changes in water chemistry in areas where logging had occurred. Again, minimal, short-term impacts were observed, and these were partly the result of slash burning, less commonly conducted as a pre-reforestation treatment today. "Nutrient increases generally declined within a few years as re-vegetation occurred," Dr. Adams wrote, "and in some cases nutrient concentrations eventually became lower in treated areas, presumably due to the heavy uptake of nutrients by young, rapidly growing vegetation." The studies Dr. Adams reviewed were conducted by scientists from several western universities, as well as the U.S. Forest Service and the Bureau of Land Management. Their findings were subsequently published in several scientific journals including the Journal of Forestry, Canadian Journal of Forest Research, Western Journal of Applied Forestry, and Northwest Science. Copies of the reviews are available at Oregon State University, Forest Engineering Department or Oregon Forest Resources Institute. Reaffirm successes of existing updated forest stream rules and related rules. Identify forest rule enhancements to better protect water resources -- recommended for adoption by the Oregon legislature into Oregon Forest Practice Rules. Dispel unfounded allegations concerning watershed damage due to forest practices, as well as dismiss ineffective protection schemes.